Animal Planet: Busted: Is Brazil’s ‘Jaguar Tony’ a Traitor and Poacher? 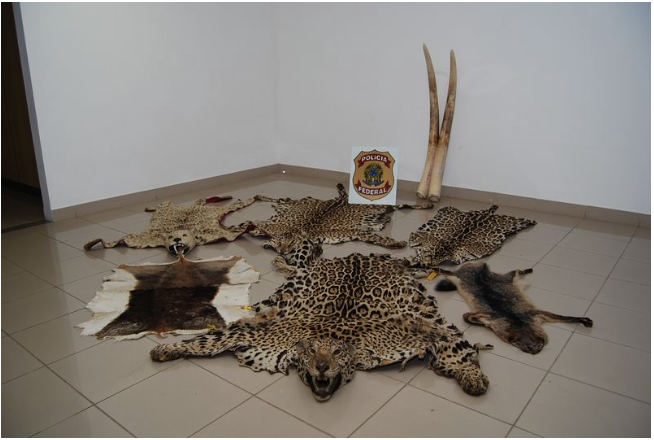 Guest blogger Laurel Neme, author of the book Animal Investigators, wildlife conservationist and host of radio show The WildLife, offers insight into how a jaguar poaching ring was recently busted. Twenty years ago Brazil’s most notorious jaguar hunter, Teodoro Antonio Melo Neto, also known as “Tonho da onça” or “Jaguar Tony,” swore off poaching after logging 600 kills. The foe-turned-jaguar-ally convinced environmental organizations of his turnaround, and began helping agencies track the animals for monitoring and research. His dramatic change of heart even became the subject of a children’s book, titled Tonho da onça, which related a conservation message. Not so fast, old friend. "Jaguar Tony,” now 71 years old, recently revealed his true spots - a traitor to jaguars. In July, federal agents arrested him and seven others as they prepared for another in a long string of illegal hunts. Following reports of missing radio-collared jaguars and jaguar carcasses found on farms in the Pantanal, the Brazilian Federal Police (BFP) and Brazil’s Environment Agency (IBAMA) launched a nine-month investigation, code-named Operation Jaguar, that culminated in searches across three Brazilian states. One of these was an early morning raid on a Pantanal farm, where agents found Jaguar Tony, his son, and the ringleader of the illegal hunts, Elisha Sicoli, gearing up for another illicit trek, this time with five foreign clients. The federal agents had timed their bust to stop yet one more kill. Jaguar Tony fled, and is believed to be hiding on a farm in the Pantanal, but police succeeded in arresting the others. They also seized a vast array of weapons and ammunition from Sicoli that, according to the BFP Chief in Cascavel, Paraná, was larger than the police’s own arsenal, and recovered hundreds of photographs documenting jaguar, elephant and rhino kills that will now provide important evidence against the poaching gang and additional leads. The scheme was straightforward. Sicoli organized and outfitted the illegal safaris while Jaguar Tony and his son acted as guides. The skilled father-son team used specially trained hunting dogs to track and “tree” the jaguars, making them easy targets. Hunters photographed their conquests and either destroyed the carcasses or made them into trophies using the taxidermy services of another gang member, Fernando Chiavenato. Chiavenato initially fled arrest in Curitiba but turned himself in a few days later. The gang targeted jaguars in Brazil’s Pantanal, the world's largest wetland - the size of Illinois - and prime jaguar habitat. While nobody knows how many wild jaguars remain, worldwide population estimates range from 8,000 to 50,000, with the Pantanal home to perhaps between 4,000 to 10,000 jaguars. Jaguars are listed as 'near threatened' internationally, according to the IUCN Red List, and are a federally endangered species in the United States, where they occasionally cross over the Mexico-U.S. border into Arizona. All international trade of jaguars or jaguar parts is prevented by the Convention on International Trade in Endangered Species (CITES). Under Brazil’s environmental crimes law (Lei de Crimes Ambientais - 9.605/98), killing jaguars is a crime. Members of the organized poaching gang face criminal charges under Brazil's Environmental Crimes Law (articles 29 and 32) and, if convicted, could receive penalties of six months to one-year imprisonment. Ninety-five percent of land in the Pantanal is privately owned, with about 2,500 ranches and up to 8 million cattle residing there. That puts livestock and jaguars in constant contact—and conflict. With their habitat shrinking, jaguars feast on the easy prey, antagonizing local farmers. In response, ranchers kill the predators or hire others, like Jaguar Tony, to do so. In Brazil, like elsewhere, killing jaguars is a crime. While in theory Brazilian law permits protection of herds from problem predators, IBAMA virtually never—if ever—has authorized it. Typically, it would capture the problem feline and release it elsewhere. The poaching gang capitalized on the tension and provided a dual service: sport for big game hunters and elimination of a deadly threat facing ranchers. While tourists paid for the privilege ($1,500 for a five- to seven-day adventure), ranchers did not. Rather, they provided payment “in kind” by allowing hunts on their land and supplying tracking dogs. The impact of this single gang on jaguar populations is potentially significant. According to BFP’s Alessandre Reis, it operated for 20 years and killed up to 50 jaguars annually, or 1,000 animals overall. Consequently, jaguars killed by this one ring may represent as much as one-quarter of the area’s wild jaguar population and up to 12 percent of the world’s. Whatever the number, Operation Jaguar and stopping this gang will go a long way toward helping the species. For a full article on Operation Jaguar, see Neme's article at Mongabay.com. Photos courtesy Brazilian Federal Police. View this article on Animal Planet.